Zingiber zerumbet, commonly known as Shampoo Ginger, is perennial from the ginger family of plants. It grows great in moist, shaded, forested areas in tropical areas around the world such as it's native home Hawaii. It is a deciduous ginger that goes dormant in the winter. Both the leaves and the pine cone-like inflorescence's arise each year in the summer from underground rhizomes. The floral bracts are green when young and red when mature. The flowers and rhizomes are very fragrant, with a pleasant warm ginger spice scent. They produce a red juice that collects inside of the flower cone. It is slightly sudsy (saponins!) and the cones can be squeezed and used for shampoo, hence the name of the plant! Collecting the sap into a paste and applying it to the hair can help brighten and condition it. The sap can also be massaged into the skin. The root is edible and traditionally used in native medicine, but is bitter to the taste, because of saponins, and seldom used. 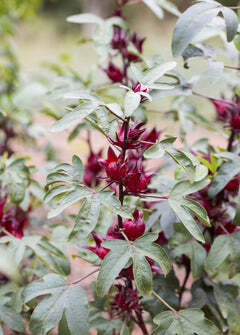 This plant and extracts of it are used in several popular industrial hair cleaning and conditioning products. Shampoo Ginger is a great plant for those seeking a natural solution to hygiene and hair care. The leaves and leaf stalks are edible, and can be used in cooking to impart a ginger flavor and taste to pork, fish, and other sources of meat. Traditionally meat is wrapped in the leaves and placed in underground ovens to cook. Medicinally the plant has several well researched uses including as an anti-inflammatory, for digestive issues, for treating diarrhea, and for treating intestinal worms. Usually, the leaves and rhizomes are macerated, powdered, and combined with alcohol as a tincture for use in Traditional Chinese Medicine. For a limited time, treat yo' self to fresh cut, all natural tropical Awapuhi flower stems that soften, nourish, and cleanse your hair and skin.